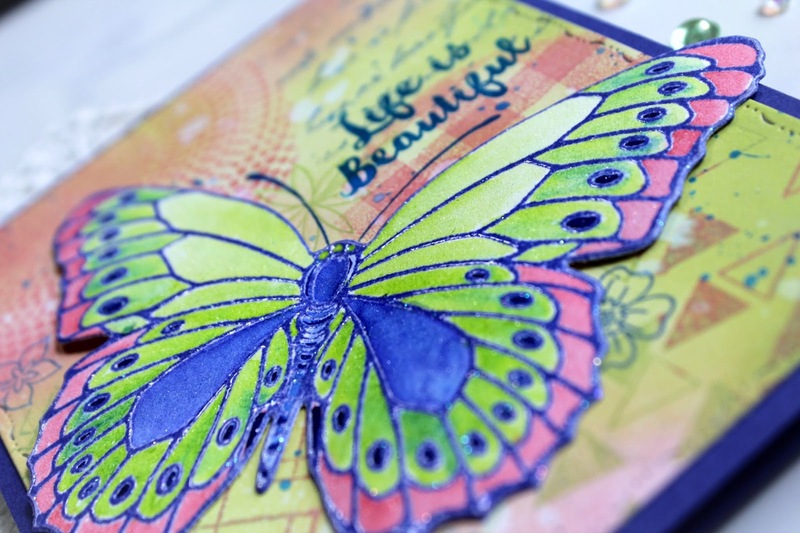 I am using Tim Holtz Distress Inks and Distress Oxide inks. The Stampin' Up Lemon Lime has more yellow in it that I thought when I first looked at the colours. But the Twisted Citron still works okay. I don't have a lot of background collage smaller stamps, but I do have a lot of background 6x6 stamps, so I used those to make my background. I started with a sheet of Neenah card stock, 4.25 x 11 to make a background for the front and inside of card. 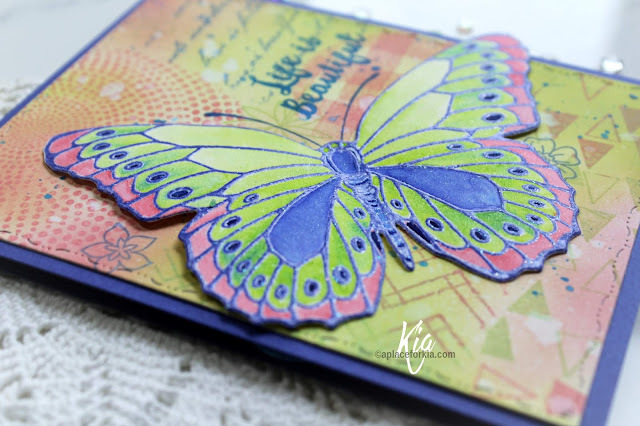 I then die cut circles in different sizes from photocopy paper, cutting in the centre of a 6x6 sheet, so I would not stamp off on anything that I did not intend, then stamped using the green and pink inks, adding a bit of the blue along the way. Once done, I went over the piece with both the worn lipstick and twisted citron distress oxide inks, and die cut with my Penny Black die. I splattered with water, dried and splattered with blue acrylic paint. I stamped the butterfly on hot press 140lb water colour paper using distress ink in Blueprint sketch and heat embossed with Pearl embossing powder. I then water coloured with the inks, and used my Nuvo Aqua Brush to add some high lights. 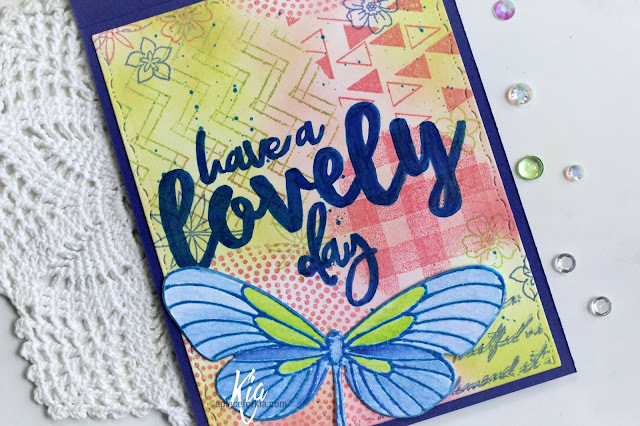 I styled the butterfly and attached to my card base using Nuvo adhesive, then stamped my sentiment from Altenew's Beautiful Day using Ranger Archival Ink in Manganese Blue. To finish, I stamped the inside with my sentiment, and added another of the butterflies which I also styled and attached with Nuvo adhesive. I had fun doing this card, which is not my usual style. It is nice to mix it up from time to time. 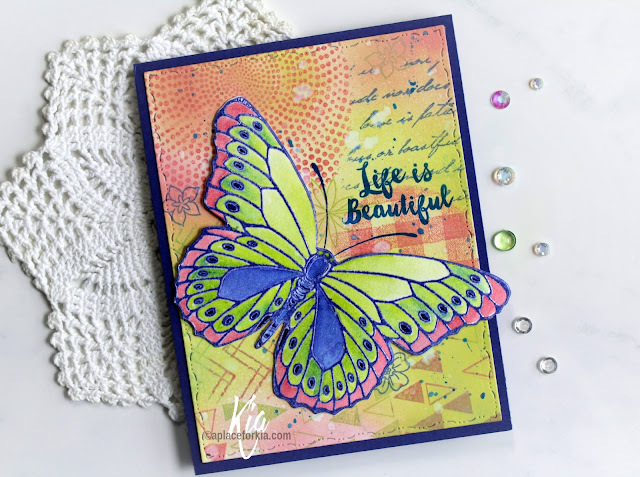 Following are Affiliate Links to the products I used for this card. Many thanks for joining me today. 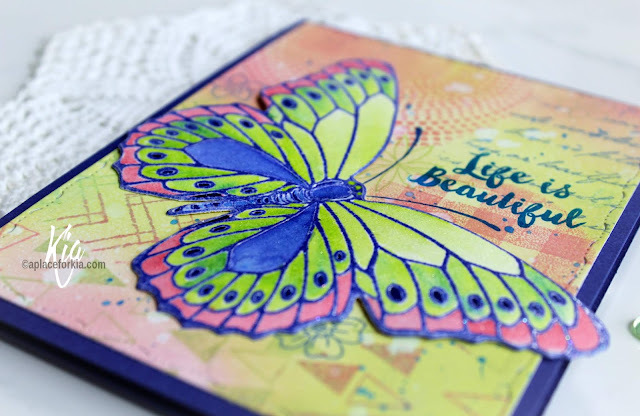 such a pretty collage style card mf...great colours. Thank you very much Karen ... I had a lot of fun doing this card.